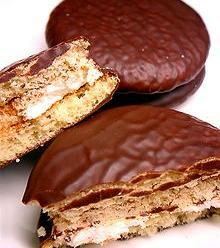 Choco pie is Korea's second most popular snack next to saewookkang. It is manufactured by Orion Confectionery which consists of two small round layers of cake with marshmallow filling, with chocolate covering, similar to a Moon Pie. Orion supplies the South Korean military with choco pies, which are given out to soldiers after their first week of basic training.